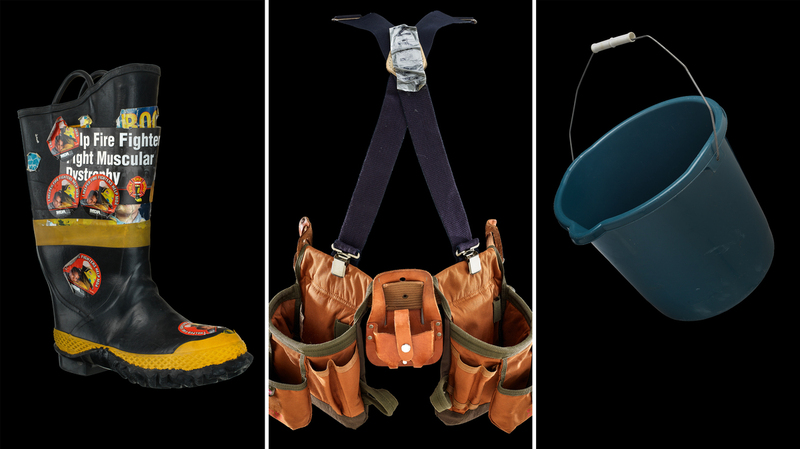 A Giving History: Smithsonian Exhibit Showcases Americans' Charitable Acts Visitors to the National Museum of American History can see artifacts like the bucket used to launch the ALS ice bucket challenge and how they played a role in charitable giving throughout history. (Left) A firefighter's boot used to collect money from motorists for the "Fill the Boot" campaign for muscular dystrophy which started in 1954. (Center) A Habitat for Humanity belt was used by a volunteer in rebuilding homes in Louisiana after Hurricane Katrina. (Right) Bucket used by Jeanette Senerchia in 2014 launching the viral ALS Ice Bucket Challenge. Remember a couple of years ago, when it seemed like we were all one big happy family, Americans of every age and political stripe, joined in common pursuit? Millions of us spent that summer pouring buckets of ice water on our heads, to raise money for amyotrophic lateral sclerosis (ALS), also known as Lou Gehrig's disease. Philanthropy has always played a big role in the United States, helping to shape who we are, what we do and how. Now it's the subject of a new exhibit called "Giving in America" at the Smithsonian's National Museum of American History in Washington, D.C. The 2014 ALS Ice Bucket Challenge turned out to be one of the most successful fundraising efforts in U.S. history. But museum curator Bonnie Lilienfeld says it had a very modest beginning — a blue plastic bucket that you might use for a mop. How Did A Simple Challenge Become A Worldwide Phenomenon? The pail belonged to a New York woman, Jeanette Senerchia, whose husband has ALS. A relative challenged her to dump ice on her head to raise awareness about the degenerative disease and to post the video online. She did just that, and the rest is philanthropic history. "People just started dumping ice on their heads," Lilienfeld says. "It seemed like a kind of crazy thing, and at the time people wondered what it really was going to do." But the grassroots campaign raised more than $115 million to fund medical research and became the latest symbol of Americans' creativity when it comes to giving. Lilienfeld says U.S. philanthropy comes in many shapes and sizes. "Like this wonderful 1764 silver plate that was given by Thomas Hancock to his church in Boston, Massachusetts," she says, pointing to a large communion dish on display. The border of the plate is inscribed with the name of Hancock's church, but also his own name, making clear to all the other parishioners that he was the one who made the donation. Lilienfeld says people not only give to help others, but sometimes to help themselves. 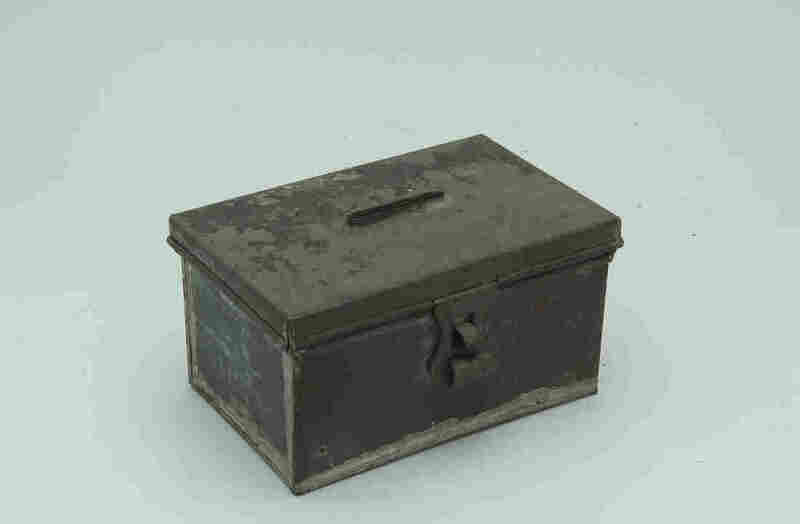 These early 19th century alms boxes were used to collect money for religious institutions and charities. Still, U.S. philanthropy has met important social needs over the years, often funding things that government did not. In the 19th century, wealthy industrialist Andrew Carnegie used his money to build libraries across the nation. He believed the rich had a responsibility to support the common good. And in the early 1900s, philanthropist Julius Rosenwald worked with Booker T. Washington to build thousands of schools in the South to educate black children, who would otherwise have had an inadequate education. The exhibit includes a metal lunch tray from one of those schools. But Lilienfeld says charity isn't just about those with money. Far from it. "It's amazing what just a little bit can do," she says, pointing to a small orange box, the kind trick-or-treaters used on Halloween to collect spare change. Over the years, the money added up, raising more than $175 million for UNICEF. 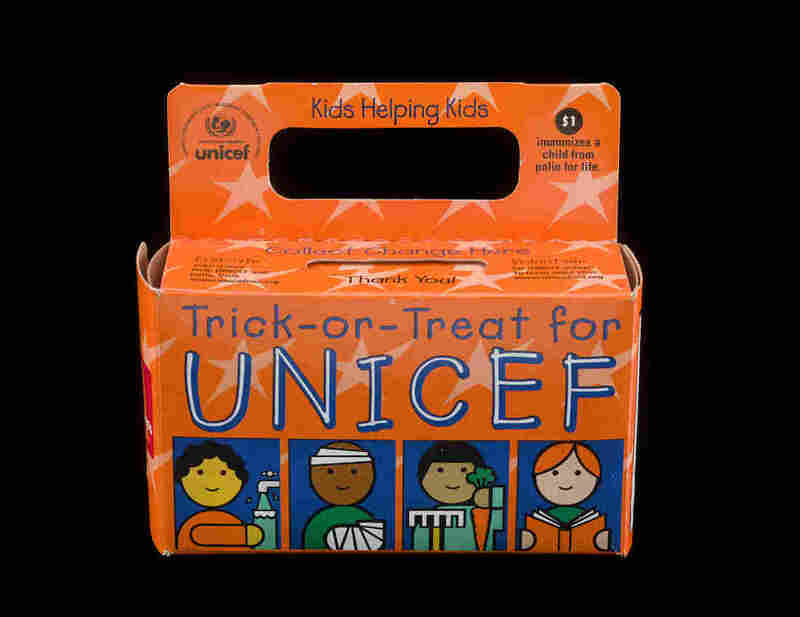 A UNICEF Halloween collection box, late 1990s. Amid concerns about world affairs after World War II, Americans were encouraged to donate to international relief. Philanthropy became the human face of global American influence and organizations and foundations frequently funded projects led by the United Nations. Sometimes, giving doesn't involve money at all. The exhibit also includes a blood donation kit. "That's really sort of the ultimate gift of really giving of yourself," says Lilienfeld. "We included that story here to get people to understand, sometimes the smallest act really is an act of philanthropy." Maryland slaveowner George Burchhartt granted freedom to his slave in a letter from 1793. She says many Americans prefer to do something more to help charity than just writing a check. There's a tool belt on display that a volunteer with Habitat for Humanity used to build a house. And a t-shirt from a charity race. But not all giving was quite so benevolent. 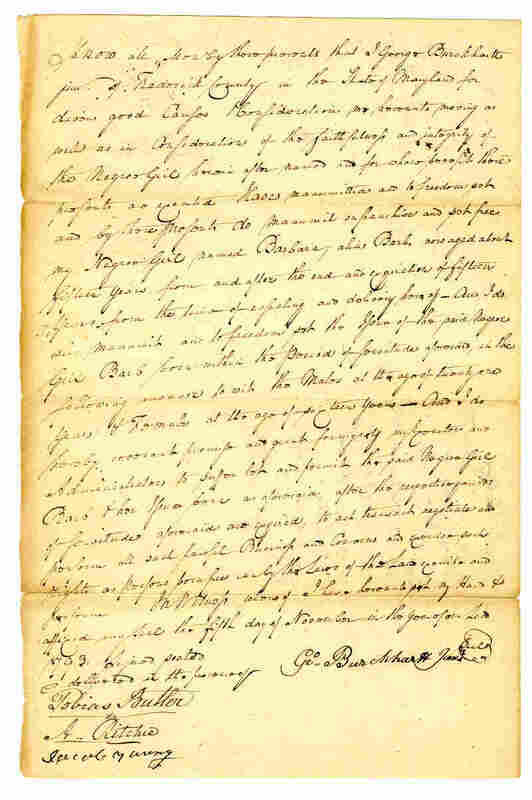 The exhibit includes a 1793 letter from a Maryland slaveholder, granting one of his slaves her freedom. "It's not always a happy story. I mean for her, at least she got freedom, but it really reminds us of the power this man had over her," says Lilienfeld. She adds that mostly, giving in the U.S. has been aimed at improving life, and seems to fill a need many Americans have to take matters into their own hands. "This idea that we come together in a crisis, we come together to take care of each other, we come together to get things done," she says. The exhibit is on permanent display at the museum.